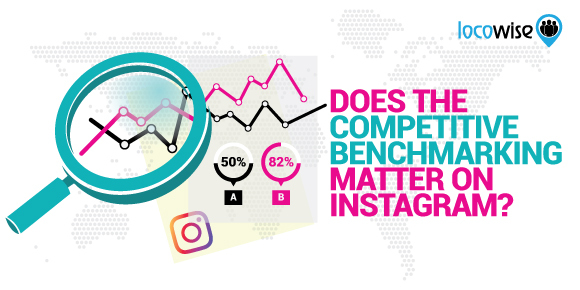 Does The Competitive Benchmarking Matter On Instagram? All social media managers have their eyes on Instagram’s growth in engagement. And they rightfully do so. Despite the constant shadowbanning of spammy and bot accounts, the social network still managed to mark an increase in user’s growth in June and July. Instagram is slowly becoming “the place to be” for brands. But that brings additional challenges for new and old social media marketers, especially ones who have been sticking to the tried and true Twitter and Facebook platforms. You probably already have an idea on how important your own analytics are. But what about your competition? How do you engage with the analytics of your competitors on Instagram? Let’s discuss. Competition on social media differs from business rivalry. While a businessman would usually want to attract the customers of the rival next door, the same isn’t particularly true for platforms such as Instagram. People can effortlessly like, engage and follow multiple brands on one network. Yet, tapping into the insights behind the profile of a competitor on Instagram can help you vastly improve your own strategy. When doing so, you are able to target a direct group of individuals who have interest in a particular industry of your choice. In addition, you can further go on an in-depth journey of analyzing a market and its performance on social media. But that just scratches the surface. In a sense, social media can provide you with the data that you’d otherwise have to run expensive surveys to get. Instagram, in particular, is a slightly different platform. Much like other networks, it allows you to increase your reach, engage with your audience and convert people into followers of your brand. But unlike Facebook or Twitter, the photo-sharing behemoth is particularly great at helping you send out your marketing message and increase your brand recognition. This is as true for you as it is for your competitors. With that in mind, being able to properly respond to the social media management strategies of your direct competitors, can help you establish your own planning routines, timing, content, hashtags and more. But let’s start with something simple. What does the Instagram audience growth of your rivals say? The audience growth shows how many new followers an account has accumulated over a given period of time, compared to a previous period. Usually calculated on a day-to-day basis, the statistic for a brand is a direct reflection of its social marketing campaigns and their performance. When analyzing the audience growth of a competitor on Instagram, you will be able to tap into their overall performance on the platform. An uptick might expose a successful strategy, a set of successful posts or even an out-of-platform advertising campaign. What’s more, the growth of your rival can give you a perspective of your current growth and how it compares in an industry setting. The audience engagement of your competitors reflects the number of times people have interacted with their posts, including likes and comments. Much like with your own total engagement, the numbers of your rivals can reveal a picture of their success on the platform. Have they noted a growth in a period? They must be doing something right! What’s more, much like with the audience growth, with the engagement of your competitors you can easily pinpoint a marketing move or a switch of content strategy. Being aware of how your competitors are performing on the platform can help you further adapt your own strategy. The Engagement Rate (ER) paints a more clear picture of how engaging the content is. Similarly to your own brand accounts, the ER of your rivals shows the total number of engagements on a post divided by the total number of followers. For example, the ER of 1% means that a total of 1 out of 100 followers has interacted with a post. The ER is one of the best statistics to use when comparing your own content to that of your competitors. While audience size matters, ER shows how engaged your following is. In a sense, the growth in followers doesn’t mean potential, unless the engagement rates stay within normal boundaries. At the same time, an increase in the engagement rate shows that your following is actively interacting with your new posts. When looking at the ER of your competitor, you might be able to receive insights on their followers and their content. For example, a growth in the audience, but a lowered engagement rates, means that they are increasing their inactive followers. At the same time, a lower growth with increased engagement directly represents a change in the social media content strategy your competitors use on Instagram. The engagement breakdown itself shows more detailed analytics about the nature of the posts. Further content breakdowns, engagement by day and audience sentiment can also help you have a better idea about your rivals and their Instagram strategy. Of course, there is a more interesting part of being able to tap into the insights of your competitors, outside of being able to see their social media performance. This includes being able to see their direct audience responses, their top followers and hashtag performance. Starting with the hashtag performance, you’d be able to note how good your rivals are at their trend interaction. As noted in our Instagram hashtag guide, jumping on an existing trend is usually the better choice compared to coming up with your own hashtag. But with a highly engaged audience, your own hashtag can increase your brand presence on Instagram and further solidify your brand recognition. Being aware of who the top response contributors of your rivals on Instagram are, you’d be directly able to tap into an established and active following in your particular industry. At times, when people respond positively to multiple companies within a particular industry, you could easily engage with the top fans of your rival. By a simple follow, like or response to a post or other interaction on Instagram with a particular individual, you’d be able to directly engage with a targeted audience. Place yourself in the shoes of a person on Instagram. Just imagine being an HTC fan and having your post liked by Samsung. Suddenly, you’d be more inclined to try out a flagship by the Korean manufacturer. While Samsung probably won’t be inclined to try out such a 1-on-1 strategy to increase their following on Instagram, this strategy might be perfect for some specific brands or industry. If you are interested in similar strategies, you can even check out the response comments on your competitors. What are they saying about your rival? How do they interact with their brand? These are all questions that might help you in the long run. What’s more, by having these at your disposal, you’d be able to paint a better picture for your client about the specific industry they are in, the target audience and more. This is a further step towards solidifying your social media marketing impact for your client. The response word cloud is another great competitor analytic that can help you better establish your brand on the photo-sharing social platform. Does the audience of your rival include positive words, or do they respond with negatives that show a specific problem within the industry? What else is the audience interested in? Such insights can serve lengths towards helping you understand the specific group of people you are targeting. On Facebook and Twitter, people are used to engaging with brands. But Instagram is another social media battlefield. People arguably tend to be more personal on the platform, yet they are also more socially aware. In addition, direct audience interaction might result from proper visual stimuli. Whatever the case might be, being able to tap into the insights of how your competitors are running their Instagram marketing strategies is a great way to solidify your presence on the platform. Whether you’d want to compare your analytics with theirs or have an awareness about their most active followers and hashtag game, the knowledge will certainly improve your own performance on the platform in multiple ways. Not to mention, if you are actually ahead, showing off a nice market report to your client is a great way to show off your social media management impact.